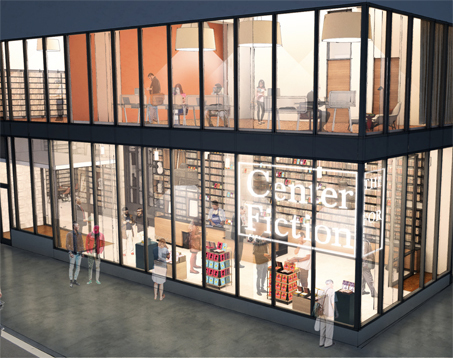 Founded in 1820 as the Mercantile Library in midtown Manhattan, the Center for Fiction is celebrating its upcoming bicentennial with a move into a large new facility in the Fort Greene area of Brooklyn, N.Y., at 15 Lafayette Avenue, across from the Brooklyn Academy of Music. The 18,000-square-foot location includes an 1,800-square-foot bookstore "featuring not just the latest novels, but deep cuts from the world of fiction including works in translation, beloved classics, and the best of indie presses, too," the Center said. The site also includes a 160-seat auditorium that will be dedicated "in the evenings to showcasing fiction across many forms with lively discussions between authors and experts in other disciplines." There is also a writers' studio, reading room, library, classrooms and café/bar. The Center's rare 19th-century book collection will be made available to the public for the first time in 30 years. The Center's grand opening party will be held on Tuesday evening.